Life Fitness's newest treadmill makes it easy to work out hard, but doesn't take up a lot of space in your home or office. The F1 SMART is a compact, sturdy folding treadmill with added high-tech innovations like an ultra-efficient Energy Saver button, access to the Life Fitness Virtual Trainer website, iPod® compatibility and charging station, and the durability you expect from any Life Fitness exercise machine. The FlexDeck® Shock Absorption System keeps joints supported while running. Perfected in Life Fitness’s state of the art biomechanics lab, the F1 SMART Treadmill has been tested by reliability experts who simulated over five million footfalls without quality loss. So solid, you’ll be surprised at how easily it folds! **iPod not included. 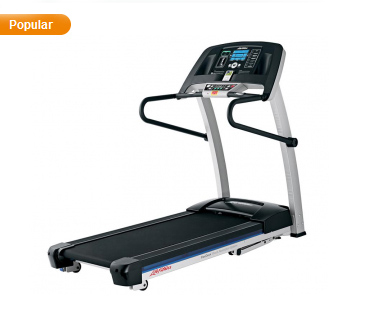 Buy Life Fitness F1 SMART Treadmill - FREE SHIPPING! Oversized, dual cupholders plus a built-in reading rack allow exercisers to use their electronic devices, books, or magazines while you workout. People enjoy exercising more with their favorite music enabled by seamless compatibility for your iPod. With controls for speed, incline, pause/resume, stop and iPod conveniently located at their fingertips, exercisers can make the most of every workout Simple navigation and ergonomically placed controls, including a lower control pad with controls for speed, incline, pause/resume, stop and iPod conveniently located at users fingertips, exercisers can make the most of every workout. And the GoSystem™ Quick Start feature remembers your preferred walk, jog and run speeds, so you can get started with the push of a button. Manual Gives you complete freedom to choose your own speed and incline levels. Hill Challenges you with intervals of multiple hills and valleys with each hill becoming progressively more difficult. Random Includes many different motivating combinations of hills and valleys. Fat Burn Maximizes caloric burn and boosts your energy level. Automatically adjusts resistance to maintain your heart rate at 80% of your theoretical maximum. Cardio Maximizes caloric burn and boosts your energy level. Automatically adjusts resistance to maintain your heart rate at 80% of your theoretical maximum. Fit Test A five-minute workout that estimates your cardiovascular fitness and can be used to monitor your improvements over time. Quick Start The fastest route to working out since you don't have to choose a specific exercise program. Cool Down Mode Based on your workout's specific time, incline, and heart rate level, this customized cool down ensures that your heart rate properly returns to a normal level at the end of a workout.